I have always been a great admirer of Victorian slide mounters. They really did extraordinary work, whether it was arranging diatoms and butterfly scales or making beautiful mounts of plant sections and insects still showing remarkable detail 150 years later. This was all achieved with apparatus that seems quite basic to say the least. Of particular interest to me are Victorian histological slides. It seems that effective microtomes were developed rather early. What was limiting was the poor range of stains available. Differential staining was in its infancy, no effective nuclear stains or stains for fatty or nervous tissue were available and many histological slides from the period have completely faded. Haematoxylin mordanted with alum was not introduced as an effective nuclear and counter stain until 1875. Carmine was used pretty much universally before that. Used alone, carmine is not an especially useful stain, but in one use it excelled. It is very useful as the colouring matter in injected preparations. In this method the blood vessels of the subject were injected with a solution of a dye, frequently carmine, with gelatine also present, at blood temperature. When cooled to room temperature these solutions solidify and when the tissue is carefully fixed and sectioned, the dye remains inside the vessels. The best Victorian mounters were able to achieve the colouration of even the tiniest capillaries in this way. In a variation of this technique the colouring matter was injected with a resistant carrier like raw latex, and the tissue wholly or partly digested away with alkali. This technique, called injection and corrosion, can be looked on as a sort of Victorian ‘plastination’ in which only, or principally, the blood vessels are preserved. The results of this on a microscopic scale, viewed with incident light, can be dramatic indeed. These injected preparations, though not necessarily greatly informative from a purely scientific perspective, are most interesting to look at, and modern techniques such as DIC can to some extent compensate for the lack of adequate staining in the surrounding tissues. In fact injected preparations were often purposely not stained. 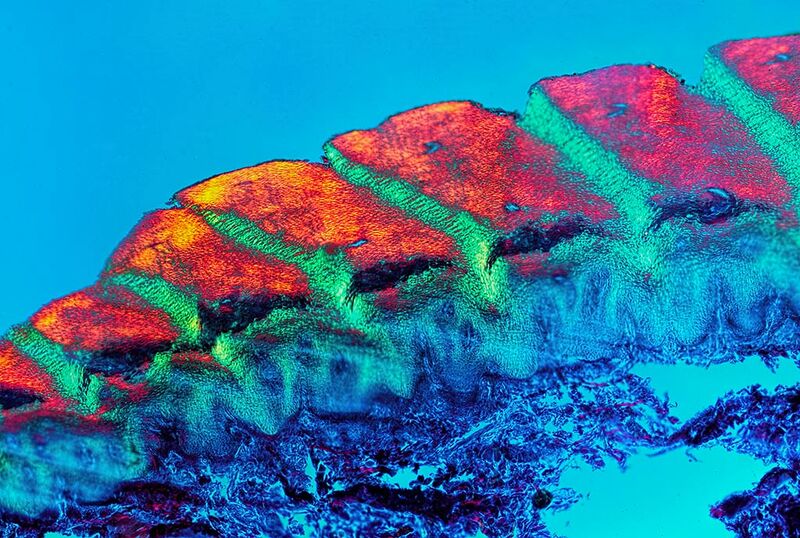 Popular subjects like the injected mammalian tongue took advantage of the birefringent properties of unstained muscle and keratinised tissue to give effective optical staining with polarised light and selenite or mica retarders. I am going to show images from a selection of these preparations which illustrate the skill of the mounters and intrinsic beauty and fascination of their results. "Hurry along and put a coat on Watson, there's a good fellow, I have a hansome waiting outside and I don't want to be late for this evening's soirée at Lincoln's Inn Fields. You have remembered it I trust?" "I recall you saying that there was a lecture demonstration of some sort at the Royal College of Surgeons that you wished us to attend. Something to do with the display of the minutest blood vessels of the skin. Knowing your positively ghoulish interest in all aspects of blood, I was hardly surprised. How have you secured an invitation? You have no medical qualification." "I was able to render the College authorities a small service. There was considerable disquiet about the apparent reanimation of one of the dissection subjects. A simple matter as it turned out. I suspected a medical student jape from the outset, and so it proved. Certainly it was unusually skilfully executed, far much too much panache for the somewhat pedestrian minds of the College authorities I fear. I taxed the perpetrators of the hoax and extracted a promise to confine their undoubted talents to their studies in the future, in exchange for their anonymity. I trust they will abide by their promise. In consideration for clearing the matter up and sparing the College considerable embarrassment and ridicule, I am now persona grata in the chemical laboratories and dissecting rooms. No small advantage to someone with my rather particular interests." "What have we to look forward to this evening?" "I understand that some most interesting microscope slides displaying the fine blood vessels underlying the skin and other organs, will be described in the lecture, and will afterwards be available for examination with some of the College's fine instruments. The behaviour of these small vessels after death is of great importance to scientific detection. I am most anxious to know how quickly coagulation occurs in these vessels. The possibility of new bruising being inflicted after death is of the utmost importance to a case I have in hand. I have great hopes of having some of my questions answered tonight. There is also the matter of the microscopic structure of the finger tips, which I hope may also be illustrated. You may have noticed that I have correspondents in India and Europe on the subject of the so called ‘fingerprints’. Don't blush Watson, I know very well you take an interest in my mail. There are indications that the surface ridges of the fingers may be quite unique to the individual and are faithfully reproduced in the prints left behind on receptive surfaces touched by the fingers. Think what that might mean for the science of detection Watson, a glorious vision indeed." "If I do glance at your mail Holmes, you know very well that it is merely so that I can keep as complete a record as possible of your cases. It distresses me greatly to see so few reach the eye of the public, and how many times you allow credit to be taken by the bumbling representatives of the official force." "My blushes Watson! I see that we have arrived at our destination. Let us now give our full attention to science. Science is the future of detection Watson, we must embrace it." After that little piece of whimsy, we should take a look at some of the slides that might have featured in the imaginary soirée. This thread is about blood and the microscopic capillaries and small vessels that do the work of conveying it to satisfy the oxygen demands of the tissues. Have you ever wondered why the smallest razor nick bleeds so much? Even a paper cut can bleed a surprising amount. Why does the smallest pinprick yield a fat bead of blood? To answer these questions we need to look under the skin and see exactly what’s going on. All the slides I show images of are from before the turn of the century, the 20th century that is! Mostly they are of human tissue, but human cadaver material would have been available to professional slide mounters in those less squeamish times. Remember we are talking about a time when grave robbers supplying the dissection rooms were far from a distant memory. First let’s acquaint ourselves with the microscopical appearance of the skin. Here it is labelled as best as I can manage from various resources. Another section, also from the sole of the foot, but injected this time to show the capillaries. 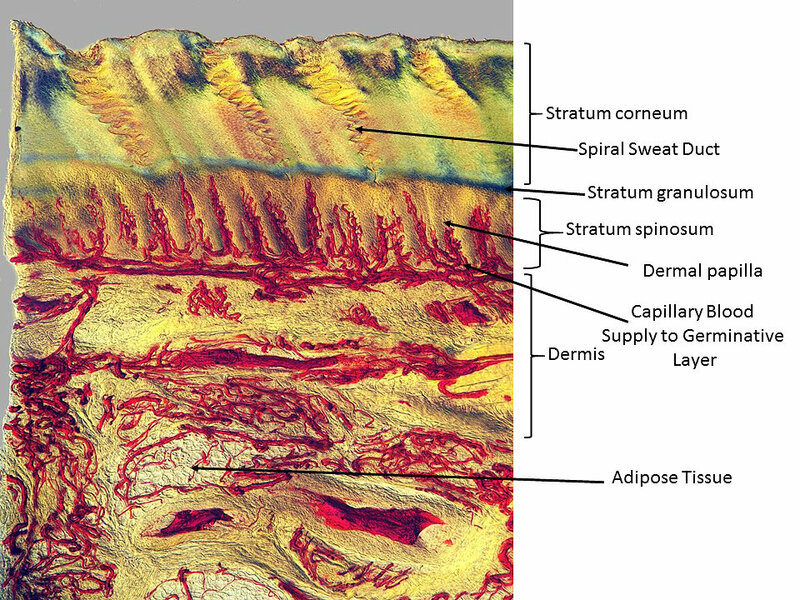 It is useful to notice how the capillaries in the Stratum spinosum appear, as it is helpful when trying to orientate the injected and corroded slides that will follow. Zeiss Jena X6.3 Apo objective. DIC with a retarder. Cropped from a stitch of 52 images. This image shows a rather poor quality ragged section, but interesting because it is the only one I have that shows the ridges and valleys of the fingerprint, albeit rather distorted and flattened. Leitz X2.5 Plan objective, polarised light with retarders, 7 image stitch. This is a long post, so just one more image now to whet Sherlock's appetite for blood and fingerprints. Slide of finger skin by Alexander Hett famous for his fluid mounted injected and corroded preparations, made circa 1850. Co-axial incident light with the Leitz Ultropak illuminator. X3.8 objective, stack of 4 images with Helicon method B. 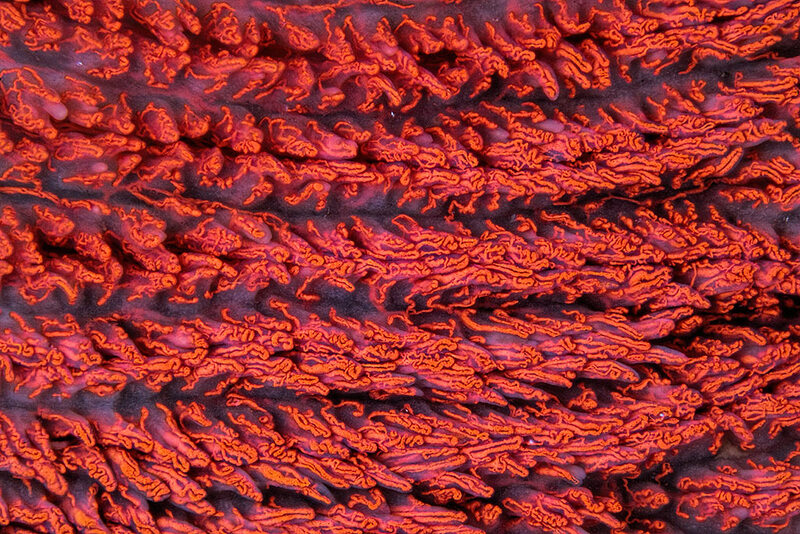 At this low magnification the fingerprint whorls can clearly be seen reflected in the capillaries that we saw are located in the Stratum spinosum. More to follow. This post wins the literary prize for sure! Eager to see next page!!! The images shown here are stiches of multiple photos. Also low power objectives have been used.So my question is what is the dimensions of the slides? Thanks Lou. It was a bit of fun to write. harisA - Field width for the first skin image about 2.5mm. Field width for the second skin image about 2mm. Field width for the third image, which I should have mentioned is skin from the palm of the hand, about 4mm. Field width of the last image about 2.7mm. I have taken many more images of the Hett slide, it's so interesting to look at and so remarkably preserved considering it is nearly 170 years old. Using external oblique incident light from two LED fibre optic arms diffused through a cylinder cut from a plastic health drink bottle works well. This image was taken with a Leitz X4 planapo objective using that illumination method, on a Zeiss WL microscope, and is a stack of 39 images with Helicon method B. Field width around 2mm. This image is the same stack restacked in Zerene PMax and converted to stereo. I have a second slide of finger skin by Ernest Hinton, probably made in the 1870's. This section is again in fluid, but thinner and more flattened. It offers a different perspective, as the corrosion is somewhat less aggressive, and more can be seen, especially under higher magnification, of the dermal papillae in which the capillary loops lie. Illumination and microscope as above, Leitz X2.5Plan objective, stack of 52 images, Helicon method B. Field width about 3mm. 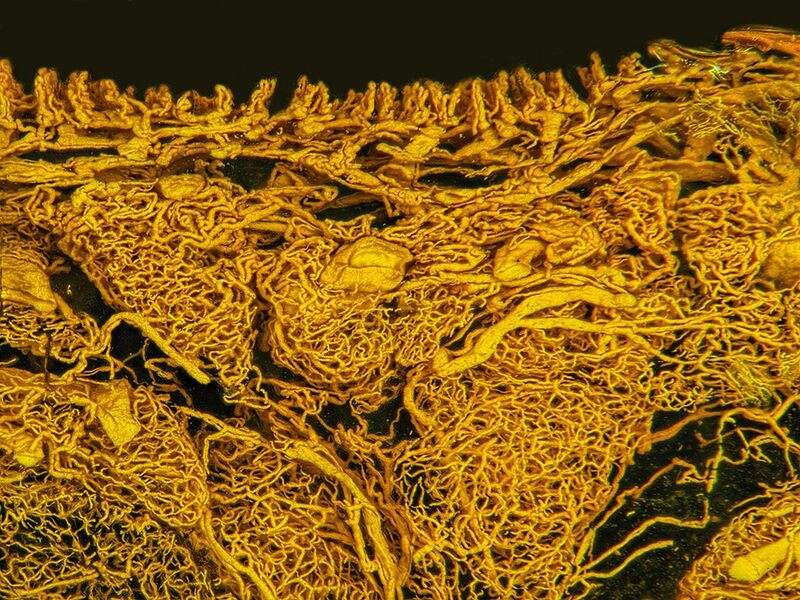 More detail in the capillary loops that project up into the actively dividing part of the epidermis can be seen. I think we can already see all too clearly why any small cutting or pricking of the skin leads to bleeding. More to follow. Troels, I can definitely promise you more things you will never have seen before. Same Hinton slide, same illumination, but higher magnification. Leitz X4 Planapo objective, 42 images stacked with Zerene PMax. Field width about 1.5mm. The more I look at this slide and images from it the more I think this is skin from the palm of the hand. Here is the Zerene cross eyed stereo version. The stereo gives a really nice impression of how the capillary blood vessels project up into the skin ridges. More to follow. Yes indeed -- this is great! Thanks Rik, there are images to come which I think are a lot more dramatic. This Hinton slide is worth another look at a bit higher magnification. The next image was taken with a Leitz plan fluorite X6.3 objective, same illumination technique. It is a stack of 21mages with Zerene PMax. Field width about 1mm. 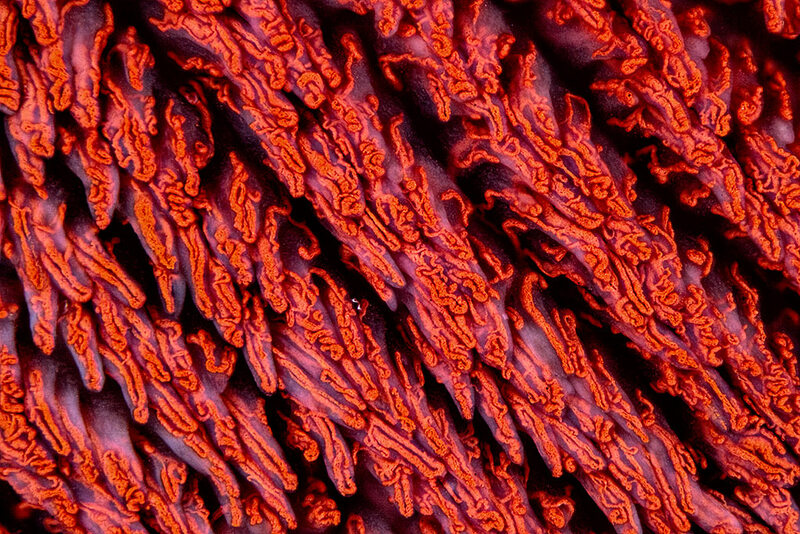 In this image the translucent dermal papillae in which the capillary loops supplying blood to the actively dividing epidermal layer are embedded, can clearly be seen. This is especially apparent at the bottom left of the image. The nature of the capillary loops and entanglements is also clearer. 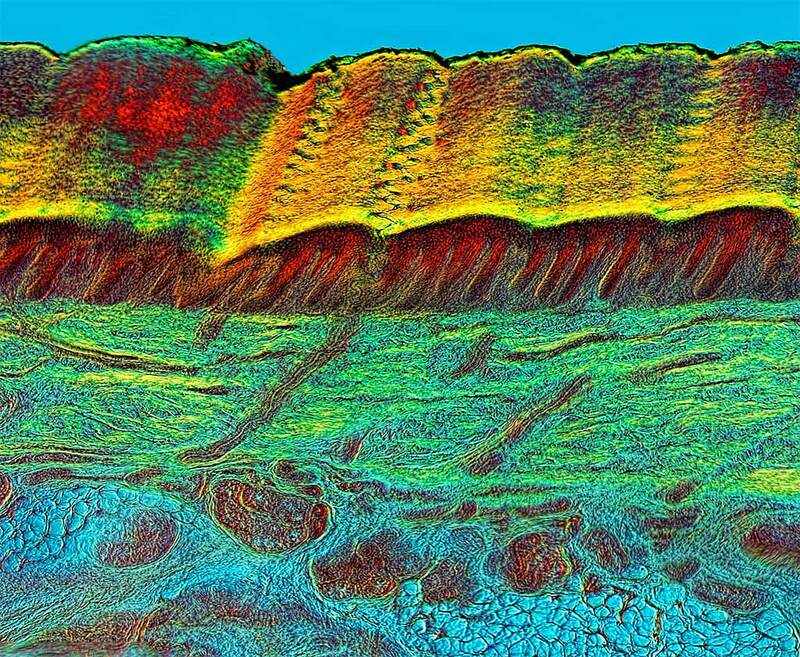 Stereo created from the image gives a strong sense of the ridge and valley structure of this skin sample. So far these 'injected and corroded' slides have given a 'plan' view of the skin. That is as if looking down from above. I want to move on now to a slide made by the famous Victorian slide maker Charles Morgan Topping. Topping was renowned for the quality of his injected and corroded preparations, and the one I have of human skin probably dates from 1850-1860. These corrosions were made using chrome yellow (lead chromate) as the primary colouring agent, though Topping added Prussian blue to colour the venous circulation and a red dye, probably carmine, to colour the arterial. Unfortunately these colours have mostly faded, but the primary chrome yellow injections often remain in very good condition. 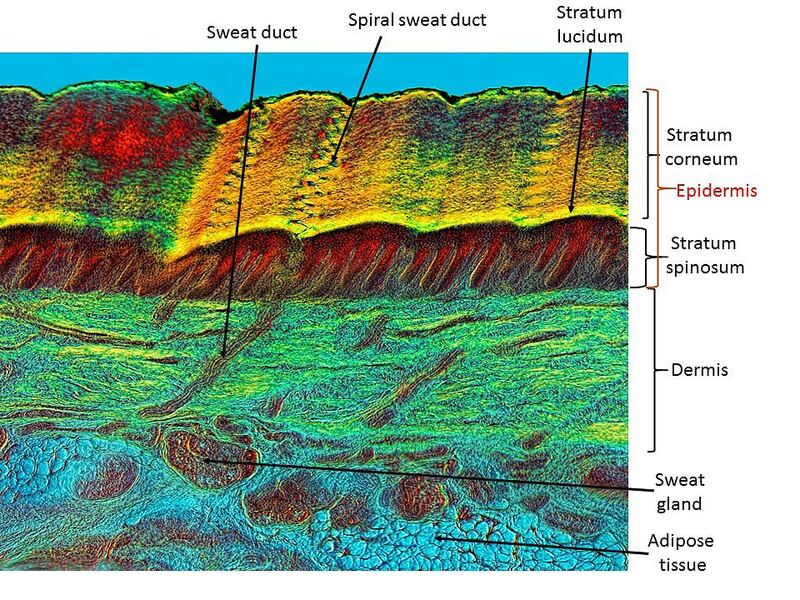 The additional interest of Topping's slides is that the often show a transverse sectional view, as with this skin section. The major problem I had photographing this particular example was that there is significant damage to the coverslip. The coverslip has been hit with an objective at some point and the resulting cracks are emphasized by incident lighting. To get a satisfactory image I had to combine polarised incident light with careful area selection and cropping, and finally some tricky cloning out of anything that remained of the damage. I think the effort was worthwhile though. That's to whet the appetite so to speak. Leitz X4 planapo objective, diffused incident polarised light. Stitch of six Zerene PMax stacks, 85 images in total. Field width about 5mm. You can spot the capillary loops at the top of the image, but remember this is a TS and can be compared with the injected transmitted light section earlier in this thread here http://www.photomacrography.net/forum/viewtopic.php?p=228464#228464 . One thing that's apparent from that last image is that there are blood vessels much larger than capillaries lurking near the skin surface. This immediately gives a big clue as to why fairly superficial cuts can bleed so much. Something else interesting can be seen if you compare this image with the earlier injected skin section viewed in transmitted light and annotated. It seems clear that concentrations of capillaries are surrounding and interpenetrating subcutaneous fat deposits. For many years this kind of adipose tissue was considered just a fat repository and rather uninteresting. Now it is clear that it is a very important hormone secreting organ as well as a store of metabolisable energy reserve. https://en.wikipedia.org/wiki/Adipose-derived_hormones . Like all hormone secreting organs it needs a well developed blood supply and these images reveal this, though of course their significance was not appreciated at the time. The next picture is of a 14 image Zerene PMax stack taken with a Leitz X4 planapo objective. Viewed as a cross eyed stereo this looks particularly interesting. A couple more images to go before I've finished the skin. Wow, just stumbled across this thread, love the presentation and the images. Thanks Moose. Those comments are appreciated.